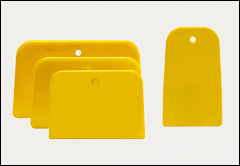 Polystyrene spreaders, spreaders, squeegees, flex spreaders, stiff spreaders, epoxy spreaders. 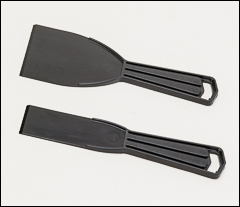 Different types of spreading tools are available on our Palette knives, spatulas and Putty knives, scrapers pages. 900 series putty knives are a one piece polystyrene handle and blade. Chisel edge for fine spreading or light scraping. 20/box but sold in any quantity. 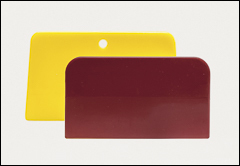 Polyethylene squeegees used for smoothing, spreading, or feathering resins and fillers. 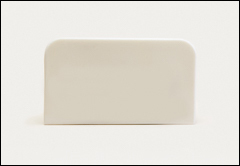 3 1/2" x 6" size is available with either a single tapered edge or two tapered edges. Resistant to acetone and resin. Low cost squeegee. Flexibility is designed for hand layup, squeegeeing resin applied to fiberglass cloth. Stiff, abrasion resistant nylon. Sometimes used in marble casting and mold cleaning or other applications where abrasion resistant spreader is required. 144/box but sold in any quantity.